With summer in the air and January’s Australian Open just around the corner, you’d be forgiven for having tennis on the brain. But if you love to watch the game yet have been forced to acknowledge that despite your best air tennis shots in front of the TV you’re unlikely to be the next Roger Federer or Samantha Stosur, then growing fitness craze Cardio Tennis may just be the thing to get you out of your armchair and on to the court. Cardio Tennis, backed by Tennis Australia, takes the traditional game and adds a fresh new spin, creating a music-fuelled aerobic workout designed around the game of tennis that makes it both a fun way to get fit and a great way to get out and meet people. Tennis centres around Australia have been adopting the fitness craze with open arms, with more than 20 different facilities offering Cardio Tennis in metropolitan Brisbane alone. Cardio Tennis began in the US in 2005 and has been growing in popularity ever since. Adrenalin Tennis, which operates out of the Redlands Lawn Tennis Association in Cleveland and has a growing Cardio Tennis program, is the brainchild of manager and head coach Damian Waddell. 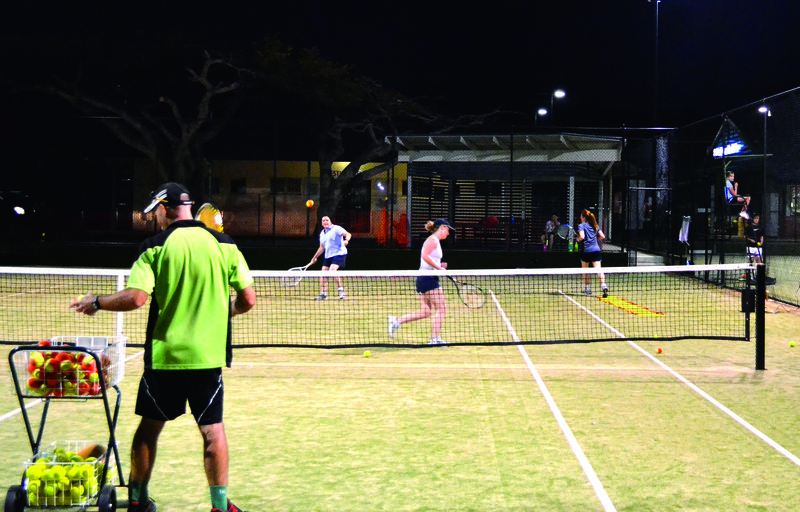 Waddell has adopted the Cardio Tennis regime and is quick to praise both Cardio Tennis and Tennis Australia (TA) for the programs they have provided. “We went to the original proposal by Tennis Australia in early 2011,” Waddell said. “Cardio Tennis was pitched to us then and it was something that I thought was a great way to be different, and so we pretty much took it up once the training [provided by TA] began,” he said. “It’s a great program that TA is running. Waddell said the thing that differentiated Cardio Tennis from a traditional aerobic workout was the integration of basic tennis skills throughout the session, without the focus being too heavily laden on technique. For those on the fence about joining a Cardio Tennis program, Waddell said the fact that the workout managed to successfully combine gym and tennis moves meant participants didn’t have to be either particularly fit or particularly good at tennis to enjoy it. “If a person feels they want to get out there and get active and healthy, and they’re not too sure what they want to do, Cardio Tennis is that thing that’s not really one and not really the other,” he said. “It gives you the opportunity to get out there and do something in a group that’s not judgemental, is fun, and gets you on your feet and off your bum. “And it can either lead to something that’s more permanent and you really enjoy and think ‘okay, this is something I really want to get into’, or it might take you into a tennis side or it might lead you into doing some other sort of physical activity. Cardio Tennis sessions generally cater to groups of about eight participants of any age, and the workloads and recovery times are designed to vary for each individual based on their fitness level and the results shown on their heart rate monitor. Twenty-four-year-old office supervisor and Cardio Tennis participant Steve Huth said even going to just one Cardio Tennis session per week was a great way to stay in shape. “Since I started working full-time in the city I haven’t been able to do as much physical activity as I’d like, but I get out to Cardio Tennis sessions with my fiancé whenever I can,” Huth said. “It’s surprisingly enjoyable, especially coming from a [competitive and coaching] tennis background, it really makes you work and I’m always pretty worn out after a session. Waddell said another benefit of Cardio Tennis was that it did not tend to cause as many injuries as either a devoted gym workout or a genuine tennis match. “To date, touch wood, we haven’t had any real injuries,” he said. Although Cardio Tennis is relatively new to Australia, Waddell said it looked likely to continue increasing in popularity. “I can definitely see it growing a lot over the next three to five years,” he said.